You’re craving some milk chocolate, but all you have is a bag of semisweet baking chocolate chips in the cupboard. You might wonder how you can turn that semisweet baking chocolate into milk chocolate. The good news is that, with a little creativity, it can be done, and quite simply. Melt an 8-oz. bag of semisweet chocolate chips in the top of an uncovered double boiler on low heat. Trying to speed up the process can burn or ruin the chocolate. Make sure the top has no water residue in it before placing the chocolate chips. A double boiler is a special pan that holds water in the bottom and has a second pan that sits on top. The water in the bottom pan should never touch the bottom of the top pan. Begin stirring when the edges of the chocolate start to liquefy. Use a clean, odor-free rubber spatula and stir frequently so the chocolate does not burn. Do not use a wooden spoon, as it retains moisture. Remove the melted chocolate from the stove and add the sweetened condensed milk and the 2 tbsp. of butter. Keep stirring as you add the contents so the chocolate is melted and smooth. If the chocolate is too thick, splash with whole milk. If the chocolate is not sweet enough, splash with condensed milk. Pour mixture into candy molds or other container of your choice and let cool. Do not refrigerate. The chocolate can keep in a cool, dry place for several months. 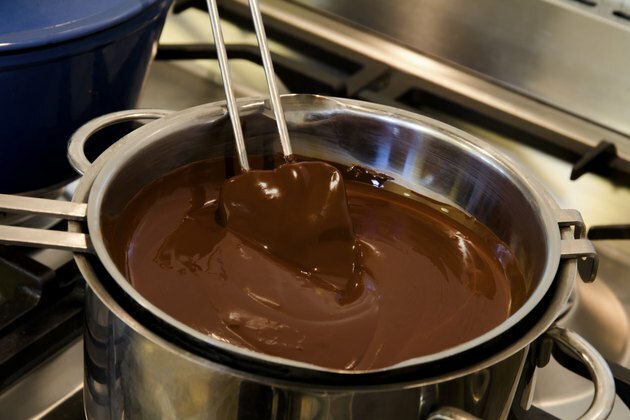 If you do not have a double boiler, melt the chocolate in the oven. Turn your oven to 110 degree F heat for approximately one hour until chocolate is melted. If you use your microwave to melt the chocolate, put it on medium and check every 10 seconds. Stir gently with spatula each time you check it. Do not let the mixture get over 115 degree F. The melting temperature for chocolate is between 86 and 90 degrees F. High heat can make it seize and cause it to be grainy and lumpy. Do not add water or cold liquids to the chocolate, as doing so can also cause the chocolate to seize. Either add liquids to the chocolate before melting, or heat them before adding them.